A quick catch up on what has kept me from blogging for the last few months. 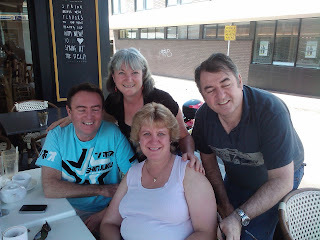 In September I met up with a small group of school friends to stat the planning for our 50th birthday reunion in 2013. The beginning of November I met up with some old friend. I was a bridesmaid for Scotty and Michele when they were married 28 1/2 years ago. They were in town for an old friends 50th and we met up for brunch the following morning. They surprised me by inviting another old friends Steve Thomas along, was so good to spend the morning reminiscing. The main thing that has kept me busy (apart from work ) was sewing for a taste of Christmas fundraiser. I spent months sewing for this big event. 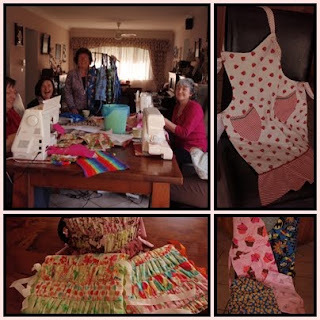 We also hosted a working bee here on the October long weekend and managed to make quite a few childrens aprons. Our Christmas stall at "A taste of Christmas". This fundraiser raised $8000 for SECET. The day after a taste of Christmas was Haylee's 25th birthday bbq celebration. we had around 45 people here for lunch. The day b4 I realised I did not organise a cake so i threw together a tower of cupcakes. I am sure there's is a lot more to tell but I am tired and need to get some sleep. I have missed you. You have been a busy girl. Your stall looked fabulous. I too have been so busy. Hope you and your family have a fabulous Christmas for Jesus's birthday.